. : Optics & Photonics Focus :: Neurosurgery goes Nano inside a Chip :. Will Excitonic Circuits Change Our Lives? Transistors that process signals by emitting flashes of light: is this the milestone of a technological revolution in computation? Whether this scenario is science or fiction, only the future will tell. One of the standing goals of neuroscience is to understand neurons at a cellular level, in vivo. A recent development takes this goal one step further by enabling axon cuts and the study of nerve regeneration on individual neurons in live organisms. Nerve Regeneration on a chip. An artist’s impression of a C. elegans worm immobilized in the microfluidic chamber, subjected to the process of nano-neurosurgery. Courtesy of Ben-Yakar’s group. Miniaturization has been the buzzword that brought about a revolution in science, in technology, and as a consequence in the way we live. By shrinking into tiny little chips whole rooms full of electrical devices miniaturization has, for example, resized powerful computers into palmtops. Recently there has even been talk about miniaturizing laboratories into tiny chips, which scientists lovingly refer to as the lab-on-a-chip. What’s next? What about putting an entire surgery room inside a little chip? What comes to your mind when thinking of a surgery room? A large space with an elevated bed surrounded by machines for anesthesia, equipment to monitor vital signs, an elaborate lighting system, a tray full of surgical tools such as scalpels, and a bunch of surgeons dressed in blue or green scrubs with masks covering their faces. Now, the group led by Adela Ben-Yakar at the University of Texas at Austin (USA), along with researchers from University of Michigan (USA) and University of Queensland (Australia), have shown that all this — except the surgeons! — can be put inside a chip a few tens of micrometers in dimension and it can successfully perform neurosurgery. In this surgery room the patient is not a human being or anything even remotely close to its dimensions. Here we are talking about neurosurgery in a tiny little worm called Caenorhabditis elegans, or in short C. elegans. The surgery room is made of a two-layer microﬂuidic chamber with a thin membrane (40μm) between the layered channels. The surgical bed is a 50μm-deep and 110μm-wide microﬂuidic channel in the bottom layer of the chip. At first sight this bed might seem too small, but it is quite enough for the C. elegans worm which is less than 100μm in width. The most interesting feature in this surgical room is how anesthesia is administered, or, to be more specific, how it is completely avoided. That’s right! Neurosurgery is performed here without the use of any anesthetic. Anesthesia is generally required for two reasons: firstly to keep the patient immobile during the process of surgery and secondly to prevent the patient from feeling any pain during the process. The worms are immobilized by pressurization of the top layer of the microfluidic chamber that results in a deﬂection of the membrane, which in turn quickly immobilizes the freely moving worm. This would be like using the suction from something like a huge vacuum cleaner to keep a patient immobile while performing surgery without any anesthetic. It may seem cruel, but worms do not feel pain anyway, due to the lack of a well-developed nervous system like ours. Hence this procedure is completely painless for them. The elaborate lighting and the monitoring of the surgical process and vital signs is provided by mounting the transparent micro-fluidic chamber on a microscope. The microscope, through its objective lens, puts the light inside the chamber and also helps collect the light scattered by the patient (C. elegans worm). The collected light is subsequently delivered to a CCD camera and displayed on a screen for the nano-neurosurgeons – the scientists involved in the work, who obviously are still normal-sized and not micro-sized – to monitor what is going on inside the chamber. To look specifically at the neurons inside the body of the worm, the nano-neurosurgeons shine light of specific wavelengths inside the chip through the objective. The light collected is then filtered to remove out all light except the fluorescence emitted by the neurons. These worms, incidentally, are genetically engineered to express a very special kind of protein (Green Fluorescent Protein) in some of their neurons that emit green light (fluoresces) when excited with ultraviolet light. Fluorescence microscopy, therefore, helps monitor the neurosurgical process in real time as the scalpel cuts through the neurons. The scalpel that we are referring to here is a scalpel that can make tiny incisions in axons (the long signal-conducting portion of the neuron) that are only a few hundred nanometers in width without causing any damage to the surrounding structures. What on earth could possibly do something like this? A highly focused laser beam acts as an ultra-sharp (a few hundred nanometers) surgical scalpel. Focused laser light with very high energy photons (wavelengths in the ultraviolet) has been in use for some time in surgery. These high-energy beams, however, are not well suited for localizing incisions inside the body with nanometer precision since there is considerable damage induced above and below the focus. Instead, light with very low energy photons (wavelengths in the near infrared) does not usually create any damage when passing through a biosample. If, however, a few tens of kilowatts of low-energy light are focused inside the biosample, due to the very high intensity (few Terrawatts/cm2) at the focus, it tends to behave like light with high-energy photons. This happens through a process that is called non-linear absorption of light and can localize damage precisely to the focus. Evidently, so much power, if put inside the sample, would cause its catastrophic heating and complete destruction. A common sense trick is used to circumvent the heating problem: high power is applied, but for an extremely short duration of time. This is the whole concept behind femtosecond-laser-induced nano-surgery: a very high power near-infrared (NIR) laser pulse is focused for a few femtoseconds (10-15 seconds) inside a biosample. This creates our ultra-sharp scalpel which enters the body without unnecessary damage and perfectly localizes incisions to the focus of the beam with sub-micrometer precision. Femtosecond laser nanosurgery, as this is called, is a very ingenious tool used for subcellular surgery in biosamples. This tool was perfected for use in in-vivo nano-neurosurgery by the group of Ben-Yakar together with researchers at Stanford University and University of California, Santa Cruz, USA in a pioneering work reported in journal Nature in 2004 . Armed with the femtosecond laser scalpel and the microfluidic surgery room, Ben-Yakar’s group has been able to perform precise axotomy (cutting axons) in the neurons of C. elegans. Furthermore, the cut axons were subsequently observed to regenerate, that is they re-grew and connected back. Such observation was also made in the previous work done under anesthesia , but here it was discovered that nano-axotomy without anesthetics leads to faster regeneration. "Anesthetics previously utilized for immobilization slowed down the regeneration processes by several hours," Ben-Yakar notes. Everything sounds very interesting, but what is the whole point of cutting axons in worms and looking at their regeneration inside a microfluidic chip? "The basic aim of this research is to know the exact biological pathways that could lead to the prevention and possibly cure of degenerative diseases," Ben-Yakar remarks. "The laser scalpel can cut nerves in living organisms with a precision of less than a micron and enables observation and study of nerve regeneration in-vivo. The microfluidic immobilization tool, on the other hand, allows high-throughput studies when large population samples are needed. These tools allow for high-throughput screening of genes, thus characterizing the proteins involved in nerve regeneration and figuring out the biological pathways. The ultimate goal of our research is to discover drugs that could stop degeneration and/or improve regeneration of damaged nerves and neurons." C. elegans offers a simple biological platform to conduct these studies. This worm has its genome fully sequenced and shares almost 65% of its genes responsible for diseases with humans, making it a model organism in biology. "It is interesting in the study of neuroscience due to its rather simple nervous system, with only 302 neurons and 7,000 synapses and gap junctions," Ben-Yakar remarks. It hence offers a very simple model for the vastly complex human nervous system. "An attractive feature of the microfluidic chip is that it also allows for post-operative care by shunting the worms into individual chambers after surgery, where they can recover as their neurons grow back," says Aravinthan Samuel from the Harvard University Physics Department (USA). "This device could facilitate high-throughput analysis of nervous system regeneration after nanoaxotomy, perhaps enabling the identification of molecules that affect axon regeneration." Nanosurgery could be used on human beings one day, but obviously not inside a microchip. "Microsurgery could largely benefit from the technological advances of nanosurgery," says Ben-Yakar. "Laser scalpels and endoscopes are being developed to bring such technology to operation rooms. Our group is also involved in such research." It is hoped that these technological advances will make significant contributions to the advancing knowledge of both fundamental neuroscience and medical neurology. However, their contributions to fundamental neuroscience at the genetic and molecular level could be deemed more significant. With such microchips it might be possible to screen a single mutation in one day, something that takes several weeks now. 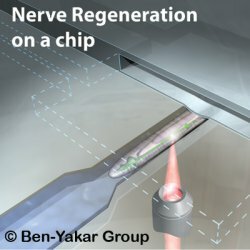 "These two technologies (laser nanosurgery and microchips) combined together could bring a breakthrough in decrypting the genetic makeup of nerve regeneration," envisions Ben-Yakar. "We will be able to characterize the proteins involved in nerve regeneration and their role in its biological pathway. Such knowledge would eventually enable the development of treatments and preventions for degenerative diseases." M. F. Yanik et al., Functional regeneration after laser axotomy, Nature, 432, 822 (2004). MM is currently working on his doctoral thesis at ICFO - The Institute of Photonic Sciences, Barcelona (Spain). S. X. Guo, F. Bourgeois, T. Chokshi, N. J. Durr, M. A. Hilliard, N. Chronis, and A. Ben-Yakar, Femtosecond laser nanoaxotomy lab-on-a chip for in vivo nerve regeneration studies, Nature Methods (2008) 5, 531-533 (link). 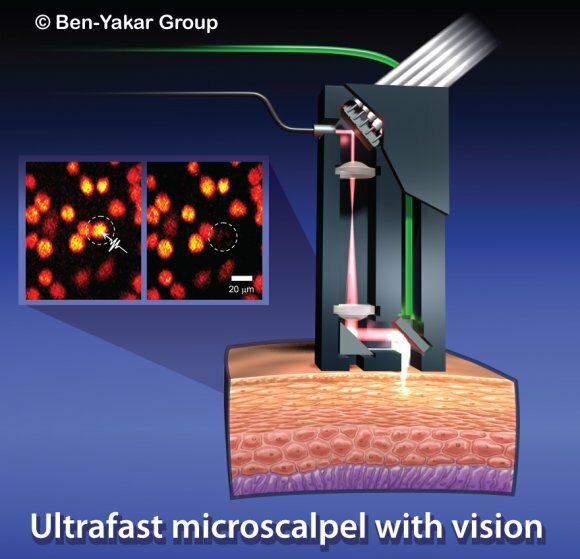 Ultrafast microscalpel with a vision. An artist’s impression of a possible design to implement the nanosurgery tool for clinical applications. Courtesy of Ben-Yakar’s group.